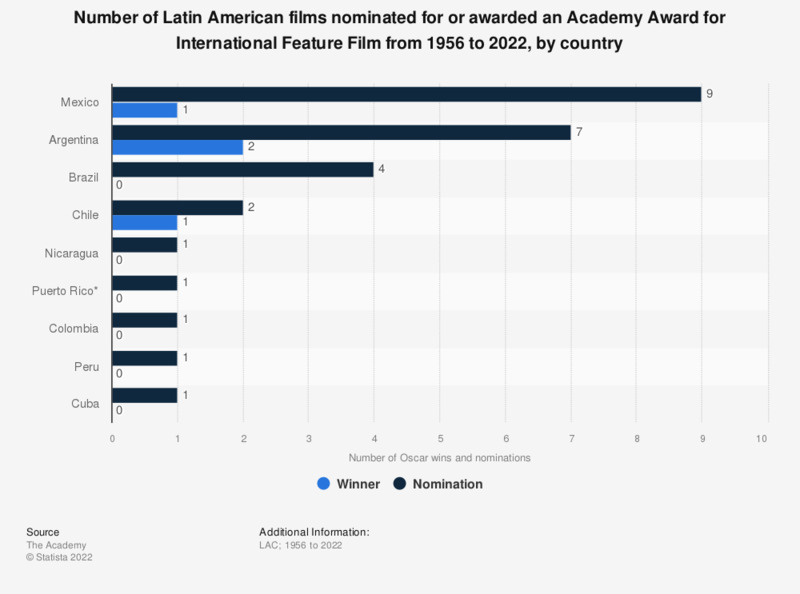 This graph depicts the number of films produced in Latin America that were nominated for or awarded an Oscar in the category of "Best Foreign Language Film" from 1956 to 2018, by country. Argentina led the ranking with two wins and seven nominations, followed by Chile with one win and two nominations. * Films produced in the U.S.'s overseas territories are eligible to apply for Best Foreign Language Film. The film "A Place in the World" (1992) submitted by Uruguay was nominated for Best Foreign Language Film but was later declared ineligible and removed from the nominations ballot.